Two early patents for a device designed to “punch holes in paper”, have been discovered. In 1867 Robert James Kellett patented a punch that had a built-in receptacle to collect the chads and prevent littering. In 1885, Benjamin Smith of Massachusetts invented an improved hole punch with spring-loaded receptacle to collect the clippings. Benjamin Smith called it the conductor’s punch. 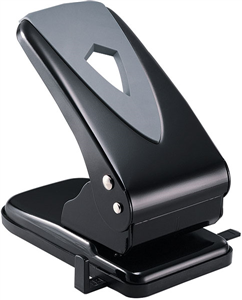 Internationally the two hole punch is most widely used, but in regions that use the U.S. “Letter” paper format ( United States, Canada and in part of Mexico and the Philippines) a three-hole punch is most common. Less frequently seen is the two-hole file binder punch. In Sweden, a four-hole standard called “triohalning” is almost exclusively used. On the TV show, The Office, Jim Halpert dresses up as “Three Hole punch Jim” for Halloween.